Dublin: An enclave for the wealthy? The danger of the ‘Shoebox’ myth. It is accepted by almost everybody that, in a city with Dublin’s geography, a home with a south or west aspect is preferable to one that faces north or east. Similarly, who could argue that having 60-square-metres to live in is better than 50? Everything else being equal, I think we’d all take those ten extra square metres any day. Unfortunately, everything is not equal. As anyone who has built a home or even just an extension will know, every extra square metre costs, in land, labour and materials. This is why homes across the world are smaller in city centres than on their fringes or rurally. People opt for location over size or other features like orientation. But what happens when that choice is taken away from them? This is the situation now facing Dublin’s residents since Dublin City Council (DCC) introduced new standards for developments in 2008. They exceed those that apply in the rest of the country, introduced by the Department of the environment (DoE) in 2007 and bringing Ireland into line with our european peers. And they are standards councillors are vigorously defending, typically appealing to an argument along the lines of “we don’t want people living in shoeboxes”. At its heart, the new standards are an inversion of logic. The one place where smaller sizes can be justified due to the benefits of location, such as access to jobs or a wide array of consumption services, is the one place where new units have to be at least one quarter bigger than anywhere else in the country. If 50-square-metres is good enough for the citizens of Cork, Copenhagen or Cologne, why in Dublin is it a shoebox? In addition to forcing new units to be a minimum of one quarter bigger than elsewhere in Ireland, all apartments must come with a basement car-parking space, a lift and a stairwell shared with no more than one other unit, and dual aspect. Where dual aspect is not possible, DCC will not consider any north-facing apartments. Each of these makes sense in a world where basement car parks, lifts and extra space are free. But as soon as you accept that each of these things costs money, what you are doing is effectively discriminating against lower-income households. Whereas those on higher incomes can choose between older or newer dwellings, the prohibitive cost of building new units means that rents of new builds will be far beyond the means of those on below-average incomes. To see how DCC’s guidelines are anti-poor, let’s walk through the maths of building a unit in Dublin city. If we wanted to build a two-bed unit in Dublin today, it would have to be at least 85 square metres. Given Irish local authorities’ disdain for tall buildings, this means that the cost of any given site has to be split across a smaller number of units than would other be the case. So where an acre costs €7.5m, instead of a 76-square-metre unit costing roughly €100,000 in land, the 85sqm unit costs over €110,000 each. The requirement for a basement car-parking space per unit – rather than for every four units, where central or close to urban rail, as is standard elsewhere – imposes a per unit cost of €20,000, rather than €5,000. Similarly, the requirement for a lift for every two units, rather than every ten, not only adds huge extra costs but also reduces the amount of space left for units. Together with the size requirements, the lift/stair requirements add nearly €50,000 to the construction costs of a two-bedroom unit. On top of this are added the costs of finance and development levies. All told, these supplemental regulations, above and beyond the DoE’s well thought-out standards applied in 2007, raise the development cost of a two bedroom unit from roughly €265,000 to €350,000. It is at this point that the developer’s profit is added in, typically a margin of 15%. (Thus an irony of these regulations is that, where viable, these new regulations mean greater per-unit profits in euro terms for developers!) Whereas 15% of €265,000 is €40,000, the same margin applied to the higher amount is over €50,000. So the final price, which includes VAT, of a two-bedroom unit in Dublin is currently €460,000, as opposed to €345,000 if the standards that apply elsewhere in Ireland applied in central Dublin. 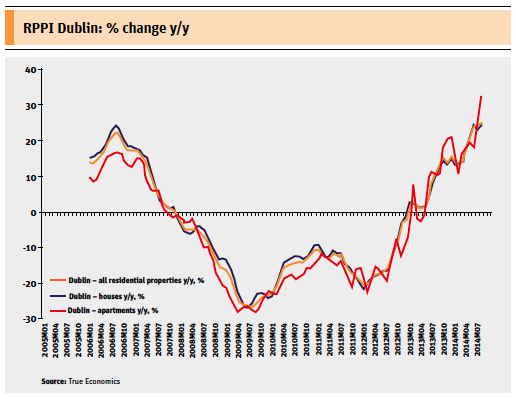 Translating this into the monthly rent required for a two-bed to be viable for an investor to buy (at a 6% yield) and thus for a developer to build in the first place, the rent for a Dublin two-bed would need to be €2,750 per month. Under DOE standards, the rent would need to be €2,050. Rents for two-beds in Dublin currently range from €1,150 in Dublin 9 to €1,650 in Dublin 4. What sort of income would you need to have to pay €2,750 a month on your rent? wonder that nothing has been built in Dublin in the last few years? 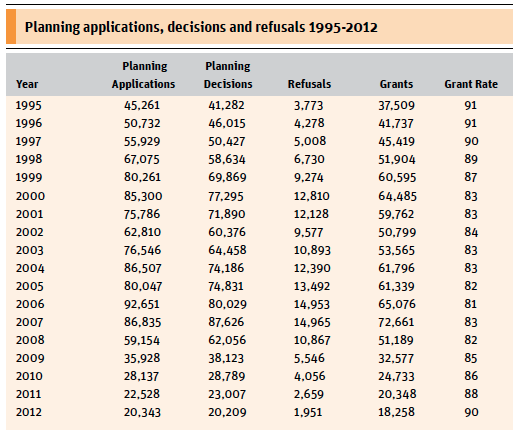 DCC’s regulations are effectively turning Dublin – or certainly its new developments – into an enclave for the wealthy. This is not to argue for a second that Dublin needs to allow shoddy construction and miserable accommodation. Far from it. There has been excellent value-creating regulation introduced in Ireland in recent years, including the focus on energy efficiency, while standards for things like green space and build quality all enhance quality of life and thus the value of a unit. The problem is that, in the rush to prevent another Priory Hall from happening again, the government is making the mistake of thinking that lots of regulation is an adequate substitute for effective regulation. Something like Priory Hall should never have happened – where the system failed was not that it didn’t regulate against it. The problem was that existing regulation was not enforced. Dublin City Council needs to understand that its actions have consequences. A family earning €45,000 a year can sustainably pay no more than €1,000 a month on housing costs. The simple maths of the construction industry means that, taking into account site, materials, labour, profit and levies, it should cost no more than €145,000 to build a home for that family, before VAT. The pro wealthy regulation introduced by DCC in relation to lifts, car parking and minimum sizes means that even a two-bed apartment would cost €400,000 ex-VAT currently. Even if my maths, or the appeals of Ireland’s Housing Agency, are not persuasive hopefully it is clear, above all else, that we need better evidence. The government ultimately sets the price of accommodation in this country, through setting the various regulations and levies, as well as through setting wages in construction, which are roughly 40% of the pure construction costs. To get the cost of building a home for those on below-average incomes anywhere close to what is sustainable for them, it is imperative that an audit takes places on the cost of building a couple of typical homes, for example an urban apartment, a suburban semi-d and a rural bungalow. This would enable policymakers to identify what adds to the cost, what is necessary and what can be tweaked to deliver better outcomes. Ultimately, the cost of building the average unit should be in line with incomes in this country. Housing is ultimately a competitiveness issue – if a couple working in IT services earning €120,000 can’t afford a nice apartment, “Ireland Inc” will lose its appeal – and perhaps more importantly a human rights issue: those on lower incomes should not be excluded from living in newer housing. The core goal of housing policy in Ireland should be as follows: good quality accommodation should be abundant and affordable. It is neither currently, and that is not acceptable. Ronan Lyons is Assistant Professor of Economics at Trinity College Dublin and author of the Daft.ie Report. Previous article What’s happening with housing policy in 2014? Next article Nothing left to lose?